Jumpin’ Jungle Cats of Jupiter! It’s another mega-collection of four complete novels of the “Man of Tomorrow,” the “Wizard of Science,” the protector of the Solar System and a menace to evil-doers throughout the universe: CAPTAIN FUTURE! Now that Captain Future (aka Dr. Curtis Newton) and the Futuremen (Grag the robot; Otho the Android; and Simon Wright, the Living Brain) have traveled not only through time but to another universe in the final story of Volume Three (See “Planets in Peril”), what other dangers will our heroes encounter? Well, THE FACE OF THE DEEP sees the Futuremen stranded outside the Solar System on a volcanic planetoid in the company of a shipload of condemned criminals. Up next is WORLDS TO COME (written by Joseph Samachson) where Curt and his crew speed to the rescue of the Sagittarian system—ready to battle in mortal combat with nightmare enemies from another dimension. Edmond Hamilton (writing as Brett Sterling) returns with THE STAR OF DREAD wherein our heroes ply their stock-in-trade by exposing a dangerous secret menacing humanity and taking desperate risks pursuing two scheming miscreants across the void! 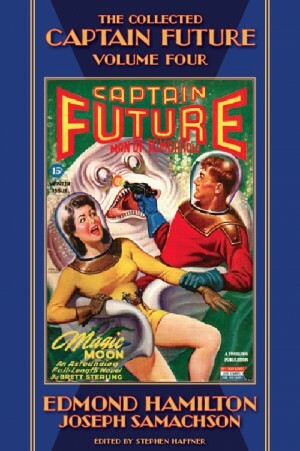 Closing out this penultimate volume of the novel-length adventures of The Futuremen is MAGIC MOON. Adorned by one of Earle K. Bergey’s finest cover paintings, we see conspirators plotting to seize the satellite Styx, third moon of Pluto, enslaving the peaceful natives, and putting Captain Future and his trusty aides on their most dangerous mission ever! 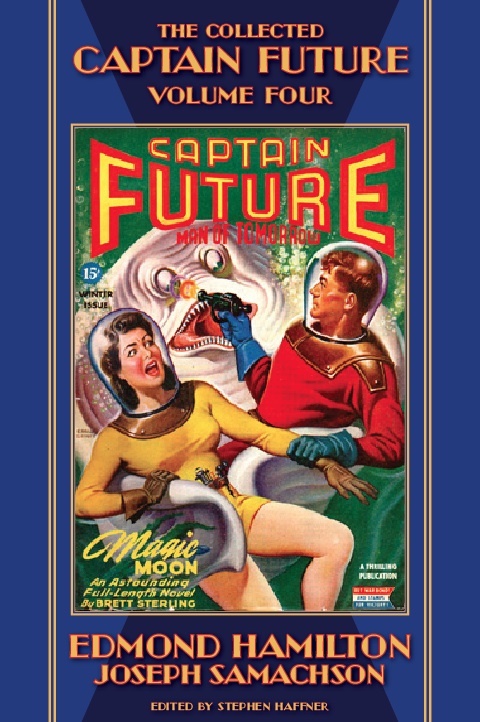 As with the previous three volumes of THE COLLECTED CAPTAIN FUTURE, “Under Observation,” the CAPTAIN FUTURE letters column is reprinted, and the original pulp covers and interior illustrations are reproduced in a generous appendix.